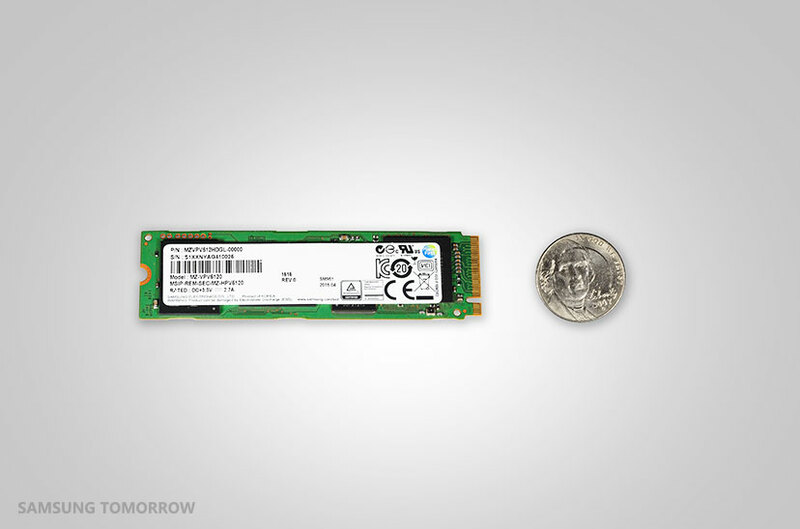 Samsung Electronics, the world leader in advanced memory technology, announced that it has started mass production of the industry’s first NVMe PCIe solid state drive (SSD) which has an M.2 form factor for use in PCs and workstations. Samsung is also the first in the industry to announce that it has begun shipping NVMe SSDs to OEMs for the PC market. The new SM951-NVMe features the industry’s most advanced performance figures, exceptionally low power use in standby mode and the most compact size of any NVMe SSD. Samsung has been offering an AHCI-based PCIe 3.0 version of its SM951 SSD since early January. Now, it has added an NVMe version to form an even stronger SSD portfolio. This follows a previous industry-first introduction of 2.5” NVMe SSDs for the server market in 2013. The new NVMe-based SM951 SSD achieves sequential data read and write performance up to 2,260 megabytes per second (MB/s) and 1,600MB/s, respectively, while using Samsung’s leading-edge controller technology. These performance figures are the industry’s most advanced, with speeds four and three times faster than those of a typical SATA-based M.2 SSD which usually moves data at up to 540MB/s and 500MB/s, respectively. The drive attains its high-speeds by using four 8 gigabit-per-second (Gbps) lanes (PCIe Gen 3.0 x4) of simultaneous data flow. This allows for a data transfer rate of 32Gbps and a maximum throughput of 4GB/s, giving the new drive a huge advantage over SATA-based M.2 SSDs, which can only transfer data up to 600MB/s. When it comes to random read operations, the SM951-NVMe can process 300,000 IOPS (Input Output Per Second), which is more than twice as fast as the 130,000 IOPS rate of its AHCI-based equivalent and more than three times faster than the 97,000 IOPS of a SATA-based SSD. Meeting all M.2 form factor requirements, the drive’s thickness does not exceed 4 millimeters, (3.73 millimeters maximum, when equipping chips on both sides of the board). This is less than the thickness of two stacked nickels. The drive also weighs less than 7 grams, which is lighter than two nickels and only a tenth the weight of a 2.5” SSD. Capacities are 512 gigabyte (GB), 256GB and 128GB. In addition, the SM951-NVMe has adopted the L1.2 low-power standby mode (which allows all high-speed circuits to be turned off when a PC is on sleeping mode or in hibernation), as defined by PCI-SIG, the PCIe standards body. By embracing the L1.2 level of standby operation, the SM951’s power consumption is drastically reduced – to under 2mW, representing about a 97 percent decrease from the 50mW consumed using an L1 state, which is the most widely used low-power mode today. In the future, Samsung plans to incorporate its next-generation 3D V-NAND technology into its NVMe SSD line-ups, which will enable even higher densities and performance. Samsung also will maintain a fast-to-market supply of advanced SSDs to meet increasing customer demand, as the company continues to lead the premium SSD market and aggressively innovates to expand the mainstream SSD segment.